Discussion in 'Overclocking & Cooling' started by DEL 707, Jan 14, 2019. Have you tried entering the memory timings/voltage etc manually? XMP is notorious for been a bit of a pain. I wouldn't of thought you would of seen to much of a difference in performance in games, is it running at 2133mhz with no XMP enabled? What if you disable XMP, can you change settings then? Have a look at "DRAM calculator for Ryzen". Supposed to help get the best out of your RAM. Change your RAM timings on the screen in your screenshot but change the RAM voltage in the location above. Is it stable with your ram at 2133? If it is it is likely you have hynix based ram which often on ryzen won't be stable at any speed above 2933. Use xmp and then change speed to 2933. How do I figure out if my stuff is hynix base? Your CAS figures show C16 timings. That'll be Hynix chips most likely... The Samsung B-die stuff which sings sweetly with Ryzen is rated C14. Also worth updating to the latest BIOS version if you haven't already. Some updates have definitely helped on the stability front. Also a mate told me to check to see if my RAM is actually supported on the Gigabyte website. Could someone double check for me, because at this point I'm thinking of just buying different RAM and trying to sell this stuff on. I have the lastest BIOS, F23. Might be worth trying XMP again, and up the RAM voltage to 1.365v. I also put a little extra on the SOC voltage, a +0.15v offset. Try the RAM volts first though. What I'm trying right now. Maybe you have a faulty or incorrectly inserted stick of ram. Try running Thaiphoon with just a single stick installed, and test both sticks individually, I used to Thaiphoon to confirm if my Corsair LPX 3200c16 was Hynix and it was. The clue was it was stable at a max of 2933c16, I just set it to DOCP / XMP and then changed the divider (Ram speed setting) to 2933 from 3200 in bios. My current ram is 3200c14 and 32GB (4 x 8GB) is completely stable. With 16GB (2 x 8GB) of the same RAM I have now it ran at 3333c14 fine, just enabled DOCP / XMP and changed the divider from 3200 to 3333 in bios. I've made a ticket to Gigabyte to ask them about the RAM compatibility my motherboard. They posted a a slightly different RAM part number, but they confirmed it isn't compatible with AMD series motherboard. I've replied with the part number I have to confirm. I decided to try some Team RAM. Worked fine for 2 days, then it crashed on the 3rd. Gotta say I'm getting quite frustrated with the build. I thought i'd install AMD Overdrive to check out my RAM voltage, but that program blue screens in Windows. Then I tried Gigabytes OC software, but that gives a crappy "This Driver can't release to failure". I've tried to sort that out but gave up. 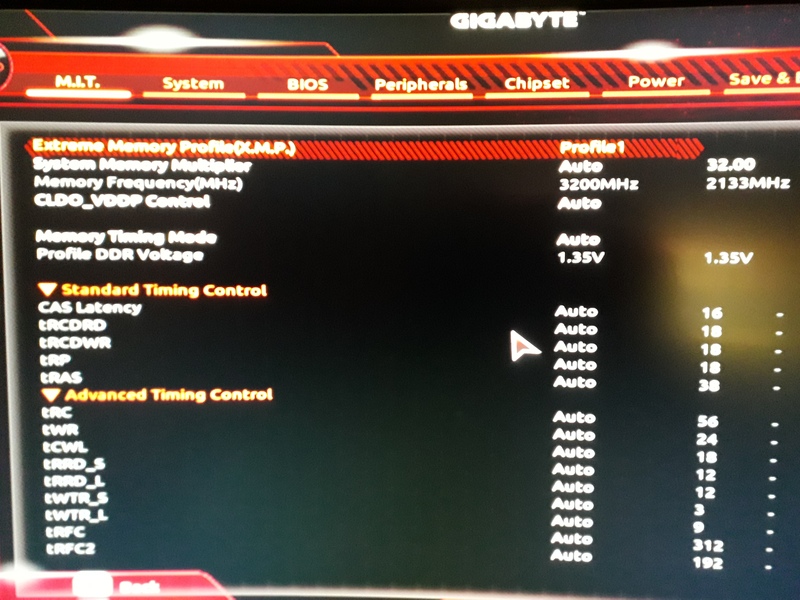 Lastly I tried SpeedFan, but all that shows is HDD and GPU temps, nothing for my CPU, or any voltages. I believe it's my RAM causing my problems, but I really am lost at this point.